Ace Frehley, with 17 months of sobriety talks about life on the road and how he stays drug and alcohol free. Kiss Guitarist Ace Frehley, sober now for 17 months, is keeping temptation down on his latest tour – and you won’t find anyone in the band or crew indulging in any drugs or alcohol around him. The legendary rock and roller with the legendary rock and roll lifestyle says that he is pretty comfortable with his sobriety at this point, but concedes that tours can be tough, and that he's not taking any chances, explaining, "This time around, I'm real serious about my sobriety, I've surrounded myself with sober people, so it's really not that tough. It's very comfortable for me at this point; I just hope I can maintain it. I believe I can, but one day at a time, right?" Rumors have Frehley's drug abuse as the reason for his departure from Kiss in 1983, by which point both Gene Simmons and Paul Stanley (the other founding members of the group) had committed to an abstinent lifestyle. Frehley admits to past mistakes, including at one point leading police on a high speed car chase, and reports that he is happier now than he has been in a long time. On sobriety, he muses, "I should have done this a lot sooner." 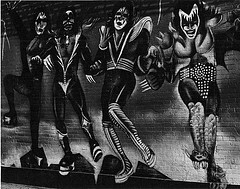 While Frehley insists he has no desire to preach to anyone on the dangers of drugs or alcohol, he acknowledges that he may have served as a role model to some fans, who may have partied a little harder than they otherwise would have, following his very determined lead. He says that he hopes his sobriety can prove just as inspiring to people, saying "Hey, you know, maybe by my example, maybe if you're thinking about turning your life around, I did it. Maybe you can do it." Frehley will release a new solo album in April, but will not be previewing any songs on this current Canadian tour, hoping to preserve a few surprises for fans eagerly awaiting his upcoming offering.